A partridge in a pear tree Braun thermoscan for my baby. Day 2's giveaway is a magnetic poetry kit. 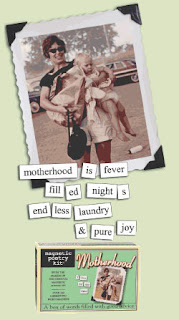 A fun collection of care-giving word magnets that new mothers and experienced moms can use to describe the crazy and wonderful world that is motherhood. Includes words like "birth", "chauffeur", "nurture", "family", "proud" and "worry". Approximately $10.00 value. Hmmm...the winner will have to let me know if it has more realistic words like "poop", "boogers" or "barf". That's really cute! Love it! I would love to give this to a couple of moms that I know! Sign me up! Great gift! I really need another excuse to stick stuff to my fridge. Love those kinds of things. Something that could be mine? All mine? Sign me up! Me! I want to win!! The magnets are so cute. Count me in. I think these things are really cute! Please sign me up! "Oink" and "bad" are the words my girls want to spell. Now there's something my 6-year-old super reader and magnet lover would adore. I have a set of "naughty" magnets. These are probably way more acceptable for my fridge. I would like to be entered. Hopefully it isn't too late to enter this one. I don't know how I missed it. Please enter me! This would be so much fun or a great stocking stuffer. If there aren't words like "boogers" or "barf" in it, I don't want it. I love to leave random comments on the refrigerator! Thanks for the chance to enrich my family with more of my wordiness! I love poetry and this looks like fun. Oh this would be great, my son's an aspiring poet and he would have fun playing with these. I like your lampshade picture. these would be fun for the older kids and notes from mommy to daddy! Cool...our fridge is truly a work of art. LOL!! what a cute giveaway...I would be able to wax poetic and leave little messages on the drivers side door of my hubby's car! I love your tagline. I used to have a mind once too. I also used to have a Fridge that was undecorated. Now I have a fridge covered with artwork. Thus the need for magnets... Count me in! This looks really fun! I'd love to win it! Please count me in and thanks for the contest! This would be super fun to have in the house. Thanks. I can only imagine what nonsense my little monsters would put together on here.